"Tired of the same old sushi rolls? Tropicana is something different. Kind of a desert roll if you will. Try it out." This recipe is strongly recommended for inside out sushi roll. So if you have yet to purchase the skills needed to make an inside out roll, please roll out to the manual. This Tropicana recipe is for those of you who wishes to try a different taste of sushi, these one is tropical, sweet and very unique. Cut the banana and avocado into strips, taking in mind that as thick as you cut the banana – the sweeter the sushi roll will be. 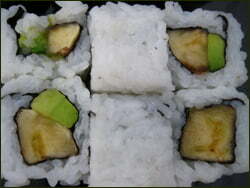 Roll it inside-out style, and spread a little bit of dark Japanese sesame on top, and cut.